After raising a family in Kalamazoo, Michigan, Pam Dykema, who often referred to herself as "Harriet Housewife," decided it was time to take on a new challenge. Just before she and her husband Bob moved to the coastal Southeast, Pam decided to further explore her artistic nature and her knowledge in the art of watercolor. It was something that she had had an interest in for a number of years. Growing up in the Midwest town of Galesburg, Illinois, Pam enjoyed arts and crafts but never became serious about any particular media. Smitten with her first few lessons in watercolor, she was hooked. North Carolina was her next home and it was there that she pursued her newfound interest, learning more and more about light and shadow, color, design and shape. 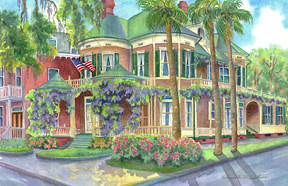 Upon moving to Savannah, Georgia in 1996, a real passion for color and design began to grow. "Savannah is like a flower that just keeps opening." Pam relishes being in Savannah to capture the beauty of its historical architecture, seasonal flowers, marshes, waterways, and beaches. In the fall of 2001, Pam joined Frances Mills in a studio/gallery in the Franklin Ward South building in the City Market district of historical Savannah. While on the 2nd floor in this acclaimed location Pam assisted in forming "Gallery" 11, a co-op gallery of 12 artists, later added #9 and currently shares space in Gallery #10 with noted portrait artist Patrick McLean. Life remains a blessing for Pam doing what she loves in a location which offers a vast amount of Savannah scenes. 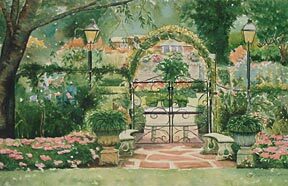 In addition to her body of work on display here and in her gallery, Pam accepts commissions to paint boat, home and personal portraits.